The nation’s greatest living civil-rights hero says what others won’t. Will other Democrats follow? 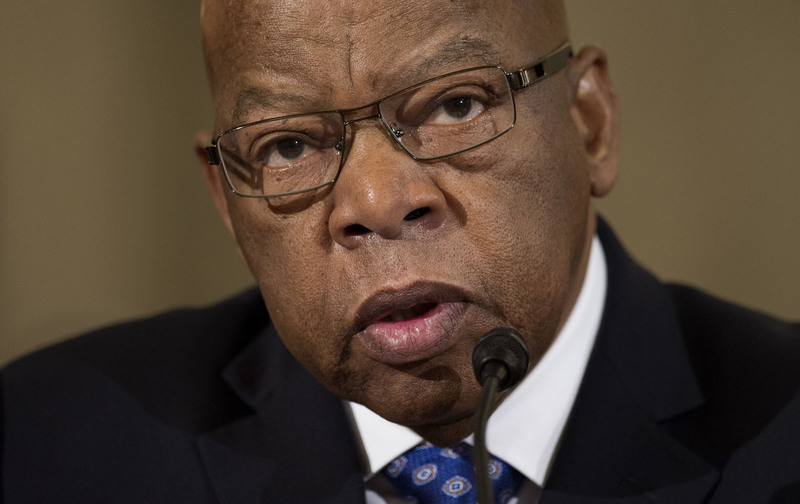 A short time later, Chuck Todd of NBC’s Meet the Press released a remarkable clip of his recent interview with Representative John Lewis, which will air on his show Sunday. In his calm, thoughtful, deliberate way, Lewis channeled Waters’s rage—and opened a new front in the campaign against Trump. Todd seemed shocked. “That’s gonna send a big message to a lot of people in this country,” the Meet the Press moderator said. Will others follow? Representative Barbara Lee, another progressive stalwart, told MSNBC’s Chris Hayes that she agrees with Lewis. The sole opponent of the Afghanistan intervention, a stalwart foe of the Iraq war, Lee had already said she would boycott Trump’s inauguration, but she acknowledged that Lewis went beyond where she did. And then she went there. Let me break this down for Axelrod, though he knows everything that I do about American politics, and then some. Republicans are the ones who have a “reflexive reaction” to Democratic presidents they don’t like: peddling birther garbage and obstructing Barack Obama, after obstructing, then impeaching, Bill Clinton. The last GOP president, George W. Bush, although he lost the popular vote (like Trump) and owed his presidency to the Supreme Court, nonetheless got Democratic backing for his education-reform push, his Medicare-drug legislation, his tax cuts, and even his Iraq War authorization. There was no “reflexive” attempt to undermine Bush. He brought greater opposition on himself, including GOP opposition, with his disastrous war of choice in Iraq, his bungling of the occupation, his shameful neglect of New Orleans after Hurricane Katrina, and his passivity in the face of evidence that shady banking practices were going to crash the economy. So I’m going to go with Lewis, Lee, and Waters over David Axelrod on this one. I don’t want to bring race into anything where it doesn’t matter, but I did happen to notice all three leaders are African-American. Maybe that’s a coincidence. Or maybe it means that people who’ve seen the worst of American injustice are trying to warn the rest of us when it’s coming for us again.